Sponsors are often drawn to contract development and manufacturing organizations’ (CDMOs) advertisements and websites by keywords and phrases such as speed, efficiency, state-of-the-art technology, partnering in the sponsor’s success, innovation, and solution provider. While these terms may draw website traffic, they don’t address the needs of sponsors’ outsourcing and quality groups who work with CDMOs day in and day out. This article and those that follow address manufacturing facility and laboratory design elements that enhance the sponsor’s experience, protect its product against cross contamination, and provide assurance that its product will be produced and tested per regulatory requirements. Historically, pharmaceutical manufacturing facilities are designed by the company’s engineers, managers, and department heads in collaboration with architects for the function of their respective areas: locate quality control next to analytical development, position the sampling and dispensing rooms inside the GMP warehouse, construct manufacturing suites along shared walls with the GMP utilities room, and house the engineering lab next to metrology. Many other internal factors influence facility design. The type of product to be manufactured dictates a number of requirements and the nature of activities conducted in cleanrooms determines their classification, direction of HVAC airflow, and pressure differentials. All of these are essential considerations. But focusing solely on internal functionality ignores the sponsor’s needs. The manufacture of a pharmaceutical, whether active ingredient or final product, sets off a convoluted chain of events that culminates in treatment reaching patients. For many sponsors, much is riding on the success of a manufacturing campaign, and it is understandable that the sponsor desires to send its experts to witness the production. This is particularly true for first-time production of a product, test drives of a new CDMO, or products that have a history of problems. To date, sponsors have had few choices for viewing their productions. Live streaming of video from manufacturing suites is an option offered by some CDMOs. However, this isn’t a great solution because of lack of sponsor control over the direction in which the camera is pointed and the inability to zoom in on activities and speak with operators. 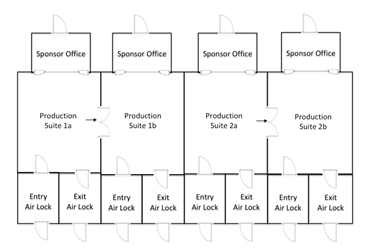 Other CDMOs allow their sponsors to view production from common hallways outside of production areas. In this scenario, the sponsor must stand in a high-traffic hallway each day of the production. Common hallways also represent a confidentiality problem when multiple sponsors are on-site to witness their production. Still fewer CDMOs gown the sponsor’s representative in a cleanroom jumpsuit and allow them to watch the production from inside the manufacturing suite. While this may seem like a fantastic opportunity, it could be problematic from a GMP perspective. There is a solution to the challenge of witnessing productions. The figure below shows a conceptual design for a portion of a manufacturing facility providing the sponsor with unobstructed views from the privacy of sponsor-dedicated offices. Floor-to-ceiling windows allow the sponsor’s representative to see into their production suite, follow along with batch record steps as they occur, and discuss manufacturing issues that arise. Dedicated offices provide a home for the sponsor during campaigns that span multiple weeks of 12-hour days, thereby eliminating the need for the sponsor to pack up their belongings at the end of each day. In cases where the production progresses to a second manufacturing suite, the sponsor can shift to the next office and continue viewing the campaign. Focusing on the sponsor’s experience makes all the difference in the world. The prevention of cross contamination in pharmaceutical manufacturing is a major concern to sponsors in protecting their product and for the safety of the patients who receive treatment. There is no single magic bullet that controls contamination. It is a combination of factors, some of which are procedural: level of gowning required for manufacturing personnel, selection and rotation of cleaning solvents used in cleanrooms, cleanroom behaviors such as slow, methodical movement of personnel and equipment, restriction of open container transfers, and cleaning of stationary and mobile equipment. 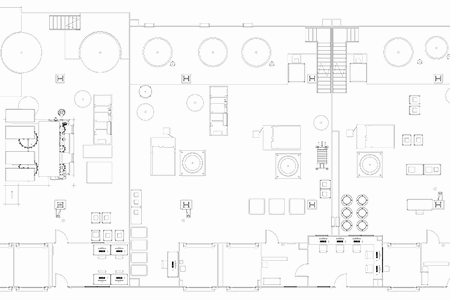 Other factors must be built into the facility design. These include HVAC single-pass air and proper pressure differentials and direction of airflow between rooms, door interlocks that prevent two sets of doors being open simultaneously, bringing air pressure differentials to zero, location of airlocks and air sinks, and pass-through ports between low- and high-classification cleanrooms. But there are other elements of facility design that are not fully taken into consideration when designing a production facility: the flow of raw materials, equipment, personnel, product, and waste. One-way direction of process flow is fundamental in prevention of cross contamination. That is, raw materials, equipment, and personnel enter and exit cleanrooms through separate sets of doors, airlocks, and hallways. Product also leaves by its own separate exit into GMP storage areas. It’s similar to driving a car on a one-way street: once a car turns onto a one-way street it must continue driving in that direction. Why is this so important? Personnel working in a cleanroom are likely to have powders or other contaminants on their cleanroom gowns (gloves, hair nets, coveralls, booties). Exiting into clean corridors or airlocks contaminates these areas, rendering them dirty. The same goes for dirty equipment and waste. Corridors and airlocks must be designated as clean or dirty and used exclusively for this purpose. Consider a facility that doesn’t employ one-way process flow. Product, dirty equipment, dirty personnel, and waste exit using the same airlocks/air sinks and corridors that clean equipment, newly gowned personnel, and raw materials use to enter. Once dirty equipment, waste, and personnel with soiled gowns exit into clean airlocks and hallways, these areas are no longer clean. If the sponsor’s CDMO choices are few, it’s wise to dig deep into the CDMO’s contamination control systems and supporting data. Go beyond the CDMO’s environmental monitoring (EM) program. Special care should be taken to ensure frequent cleaning of multi-use areas and tight alert and action limits are in place. This is especially true for CDMOs that manufacture high-potency compounds in the same facility as non-high-potency ones. There must also be a rigorous multilevel gowning procedure that requires personnel to remove the entire top layer of cleanroom gowning supplies prior to exiting the cleanroom to the airlock/air sink. Procedures must be in place and in practice for cleaning and wrapping of mobile equipment, including equipment wheels and any other exposed surfaces. There are compliant CDMOs with production facilities that do not use one-way process flow, but they are few and far between. It is up to the sponsor to ensure their compliance prior to the start of a manufacturing campaign. A facility’s utilities are essential for GMP operations. Pharmaceutical-grade gases, electrical, solvent extraction and exhausting, heating, ventilation, and air conditioning (HVAC), purified and water for injection (WFI), clean steam generators, and cleaned compressed air (CCA) are critical for operating manufacturing equipment and ensuring high-quality filter air for cleanrooms, yet CDMOs seldom allow the sponsor to see these systems. It’s generally the CDMO’s lack of pride in the appearance and their concerns about the compliance of equipment that are the roadblocks. This mind-set needs resetting. Consider GMP utility areas that are designed specifically with the sponsor in mind. The layout should adhere to the following guidelines. Locate each utility for ease of repair and maintenance by technicians and in direct line-of-sight of the sponsor. This is paramount for compliance. Maintenance and repairs to equipment are less likely to be performed completely and consistently when utilities are placed haphazardly (i.e., inches from a wall or too close to other equipment). The sponsor’s quality group will also want to inspect the labeling of the utilities with calibration, validation, and maintenance stickers. If a utility is too difficult to access, the probability of the utility being beyond its calibration or maintenance intervals is high. Related utilities, such as city water, reversed osmosis, deionized water, water for injection stills/holding tanks, and clean steam generators should be grouped together in the same utility yard or rooms. To do otherwise shows poor planning for the design and lack of insight into potential future expansion. Utility areas are the first to get the ax when cost-cutting measures are applied during facility design. Sponsors can easily identify these issues when their CDMO places a new piece of water processing equipment in a separate building or outside of the utility yard due to overcrowding in the area where the primary system is housed. Oddly located utilities are likely the result of an after-thought, and sponsors should request to review not only the utility’s validation documentation but written risk assessments and change controls. Proper placement of clear signage on each utility is an indicator of organization. A well-designed and maintained utility area will identify the name and asset number of all utilities and also indicate the direction of flow (i.e., arrows) for all process piping supporting CCA, nitrogen, vacuum, CO2, WFI, HVAC cooling towers, and HVAC air ducting in and out of cleanrooms. 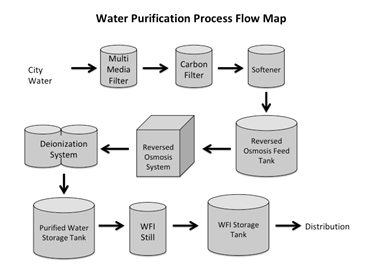 A macro process flow map (PFM) should be posted in the utility area describing the major utilities of a system (see figure below) as well as a micro PFM for each individual utility, depicting all sampling points and processing stages. Macro and micro PFMs should show feedback and recirculating loops where applicable. The benefit to the sponsor is clarity that the CDMO understands the utilities it employs and that each system, including interconnections between systems, has been well thought out. During an audit of a CDMO, I inspected the facility’s WFI system and support utilities. The first step in the process was the cleanup of city water by use of anion and cation resin tanks. The actual positioning of the resin tanks conflicted with the CDMO’s validation documentation that required the following flow: city water è strong cation è weak base anion è strong base anion. The strong anion resin tank was placed at the position of the strong cation tank. Had there been a micro PFM at this utility, the CDMO’s tank supplier might have properly placed the tanks in compliance with validation requirements. For ages, facility design focused solely on the infrastructure needs of the CDMO without including the requirements necessary to meet the needs of the sponsor. The sponsor’s ability to witness productions first-hand and assurance that its product will not be contaminated by another product or process is a design requirement, not a “nice to have” feature. Designing manufacturing facilities to meet sponsor needs is not hard to do, but it does require proper facility planning. The next article in this series discusses the sponsor’s perspective on GMP testing laboratories, immediate notification of facility issues, and equipment redundancy. Greg Weilersbacher is the founder and president of Eastlake Quality Consulting, a GMP consulting firm based in Southern California. Over the last 25 years, Weilersbacher has held director and VP positions leading quality assurance, quality control, analytical chemistry, materials management, GMP facilities, and product manufacturing in biotech and pharmaceutical companies. His unique experiences and technical background have led to the manufacture and release hundreds solid oral, sterile, and biologic investigational products to clinics in the U.S. and abroad. Weilersbacher can be contacted at weilersbacher.greg@gmail.com.